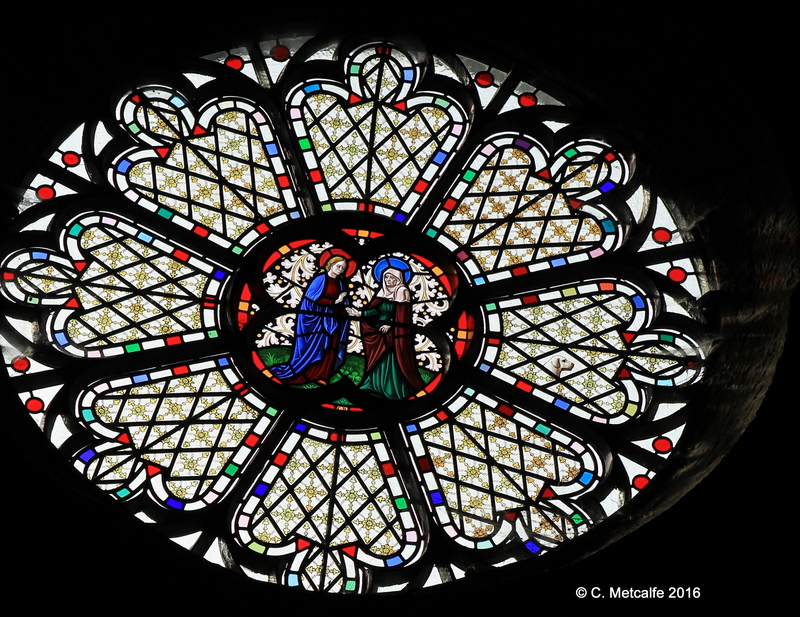 This window can be seen in the Clerestory, high up on the right hand side of the church as you face the altar, in the nave, or main body of the church. The picture is called The Visitation. It shows the meeting of the Blessed Virgin Mary, who became the mother of the Baby Jesus, and her kinswoman, Elizabeth, soon to be the mother of John the Baptist. The story is told in the Gospel of St Luke. Mary, pregnant with the baby Jesus, visited her kinswoman Elizabeth, who was in the sixth month of her own pregancy. Both women were unexpectedly pregnant: Mary had conceived before her marriage to Joseph, and Elizabeth, who had been barren until then, was now expecting a baby ‘in her old age’. Mary travelled to a town ‘in the uplands of Judah’. At the house of Zecheriah and Elizabeth, the baby stirred in Elizabeth’s womb when she saw Mary. Filled with the Holy Spirit, she felt the baby leap for joy. Mary then spoke the words that have been turned into the beautiful anthem, Magnificat. An angel may have appeared, according to the Gospel of St Matthew. The Feast of the Visitation in the Church year is on 31 May. The two central figures in this window are presumably Elizabeth, the older lady depicted on the right, and Mary. Both have haloes: Elizabeth’s is blue and she wears red over green; Mary’s halo is red and she wears blue over red. The pattern, background and foreground are very beautiful. There is also a dog’s head on the right hand side, representing a pet dog, presumably at the request of the donor. Of course we should not take the dates of the Annunciation (25th March), the Visitation and the other festivals connected with the Virgin Mary too literally. I have found another 7 festivals connected with the Virgin Mary in A Handbook of Dates for Students of English History, ed. by C.R. Cheyney. The dates were created by the early Church to mark the times of year, give some days for celebration, and bring the saints closer to our world. The dates are not necessarily historically accurate, and some have been changed in recent times. Sources: The East Grinstead Clarion, Summer 2009, pp12-13, article ‘Don’t forget Your Binoculars’ by Dr Christopher Wheatley. C.R. Cheyney, ed. A Handbook of Dates for Students of English History.